^ Barnard, Edward S. & Yates, Sharon Fass, ed (1998). “Trees”. Reader's Digest North American Wildlife: Trees and Nonflowering Plants. The Reader's Digest Association, Inc. p. 131. ISBN 0-7621-0037-0. ^ Tanner, George W.; J. Jeffrey Mullahey; David Maehr (July 1996) (PDF). 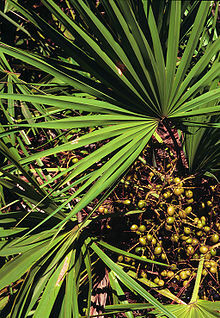 Saw-palmetto: An Ecologically and Economically Important Native Palm. Circular WEC-109. University of Florida Cooperative Extension Service. http://edis.ifas.ufl.edu/pdffiles/UW/UW11000.pdf. ^ Whitford AC (1941). “Textile fibers used in eastern aboriginal North America”. Anthropological Papers of the American Museum of Natural History 38: 5-22. ^ Prager N, Bickett K, French N,Marcovici G (2002). “A randomized, double-blind, placebo-controlled trial to determine the effectiveness of botanically derived inhibitors of 5-a-reductase in the treatment of androgenetic alopecia”. J Altern Complement Ther 8: 148-52. doi:10.1089/107555302317371433. PMID 12006122. ^ Wilt T, Ishani A, Mac Donald R (2002). Tacklind, James. ed. “Serenoa repens for benign prostatic hyperplasia”. Cochrane Database Syst Rev (3): CD001423. doi:10.1002/14651858.CD001423. PMID 12137626. ^ Boyle, P; Robertson C, Lowe F, Roehrborn C (Apr 2004). “Updated meta-analysis of clinical trials of Serenoa repens extract in the treatment of symptomatic benign prostatic hyperplasia”. BJU Int 93 (6): 751–756. doi:10.1111/j.1464-410X.2003.04735.x. PMID 15049985. ^ Bent S, Kane C, Shinohara K, et al (February 2006). “Saw palmetto for benign prostatic hyperplasia”. N. Engl. J. Med. 354 (6): 557–566. doi:10.1056/NEJMoa053085. PMID 16467543. ^ Dedhia RC, McVary KT (June 2008). “Phytotherapy for lower urinary tract symptoms secondary to benign prostatic hyperplasia”. J. Urol. 179 (6): 2119–2125. doi:10.1016/j.juro.2008.01.094. PMID 18423748. ^ Tacklind, J; MacDonald R, Rutks I, Wilt TJ (April 2009). Tacklind, James. ed. “Serenoa repens for benign prostatic hyperplasia”. Cochrane Database Syst Rev (2): CD001423.. doi:10.1002/14651858.CD001423.pub2. PMC: 3090655. PMID 19370565. https://www.ncbi.nlm.nih.gov/pmc/articles/PMC3090655/. ^ Djavan B, Fong YK, Chaudry A, et al. (2005). “Progression delay in men with mild symptoms of bladder outlet obstruction: a comparative study of phytotherapy and watchful waiting”. World J Urol 23 (4): 253-6. doi:10.1007/s00345-005-0005-7. PMID 16175413.